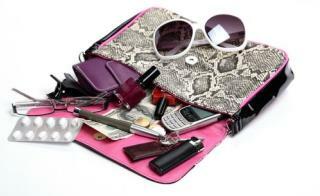 (Newser) – Remember when your purse's contents were private? Then gossip magazines started asking celebs to show off what was inside their bags. Now, Atossa Araxia Abrahamian writes at the Pacific Standard, it's become a phenomenon: From education periodicals to tech blogs to newspapers, everyone wants to know what's in your bag. For Foreign Policy, it's a war reporter's bag that's of interest; the Verge is more fascinated by the contents of a Silicon Valley worker's handbag; the Wall Street Journal reveals what executives carry. I am more obsessed with junk in my trunk. "The bag traditionally is designed to hide your personal activities—but now you display it because you know that no matter what you do, everyone will know who you are, what you’re doing, where you live," I'm so tired of redefinitions. The 'bag' was invented to carry stuff. Period. Historically, some people hide things, others just take some of the stuff they had in one place, and relocate it to another, or utilize what's in it on the go. Cause that's really, really convenient. Who ever said bags were primarily tools for privacy? Some woman who's embarrassed of her tampons? Backpacking weed dealers? Stuffy uperclass snobs in the Victorian Era? Social media didn't open up people's bags, as I remember people gleefully emptying out their contents for friends at coffee shops or lunchroom tables long before the internet existed.. Just because you can 'fish' for strangers' attentions online doesn't change anything. Correlation does not equal causation. So it all started with Capitol One.... What's in your wallet? Nosy.